The organization of the tournament has granted an invitation to the Spanish, who will bid farewell to tennis at the Caja Mágica. David Ferrer has chosen the Mutua Madrid Open as the last tournament of his professional career, and the Mutua Madrid Open has accepted the decision of the Spanish with open arms. This Friday, the organization of the tournament awarded the first wild card to Ferrer, who can bid farewell to the circuit in the Magic Box, from May 3 to 12, before the eyes of his audience. "David is one of the most important tennis players of our country, with a career to frame, but above all it is an exceptional person, of the best that I have found in the circuit ", said Feliciano Lopez, Director of Mutua Madrid Open. "I have shared many years with him and I can say that it has been a tremendous pleasure. It is an honor for us that he is going to play the last tournament of his career at the Mutua Madrid Open. It is sure that it will be an emotional retreat, at home and before the fans who have vibrated with their claw, their passion and their delivery. Ferrer can go calmly because he has given everything he had inside ". Professional since the 2000 season, Ferrer announced at the end of 2018 his intention to bid farewell to the elite in 2019 playing some of the most important tournaments of his career. The Alicante, who became number three in the world, marked the Mutua Madrid Open as the last stop of his journey in the circuit, before closing a successful stage that will conclude at 37. Ferrer has participated 15 times in the Mutua Madrid Open, achieving its best results in 2010 and 2014, two seasons in which reached the semifinals. According to his sporting merits, with 27 individual titles, the Alicante will go down in history as one of the best Spanish tennis players of all time, with a career of legend that will be remembered forever. In addition to those 27 titles, Ferrer account in his extensive curriculum with three Davis Cups (2008, 2009 and 2011), a final of Roland Garros (2013) and seven participations in the ATP Finals, which further enhance his figure. Coinciding in an era with four giants of the size Roger Federer, Rafael Nadal, Novak Djokovic and Andy Murray, four colossus, Ferrer managed to reach a competitive level so high as to intrude in that group, opening a gap in the maximum moment of form of his opponents, which further highlights the merit of the Spanish player. 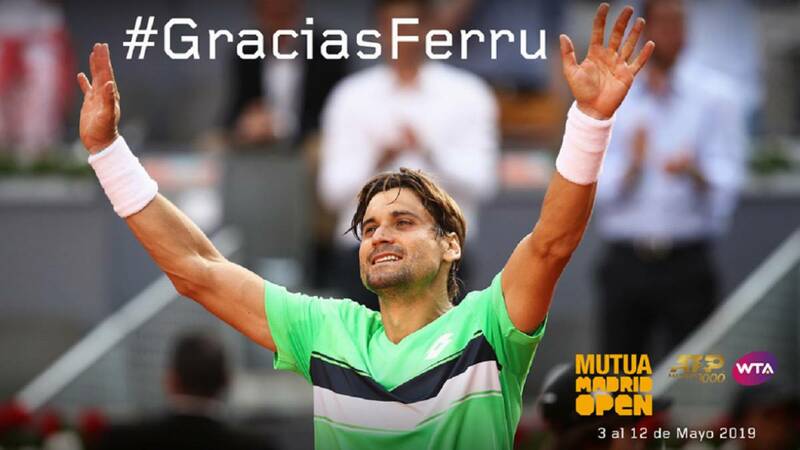 As a reason for the farewell of Ferrer's professionalism, the Mutua Madrid Open will perform a series of e acts of tribute that will be unveiled in the coming dates.